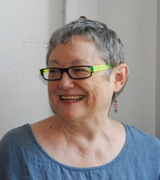 I am a writer because of my small place in American history, as a middleclass white female “bohemian” who has lived an unspeakably orderly life, held down full time jobs, paid taxes and a mortgage, lived in the same house in Brooklyn, New York, for more than 30 years, and raised kids to hold up all kinds of old WASP virtues: honesty, table manners, love of justice, good grammar. I am a writer because my small place in American history began in Jamestown and most of it centered in the Southern United States, hip deep in the stain of chattel slavery and all its ugly descendants and lulled by the story-telling traditions and linguistic seductions common to that territory. I am the wife of Basil King, a defining relationship in my life. I am the mother of Mallory and Hetty and grandmother of Satrianna, Kirin, Evelyn, and Agnes. 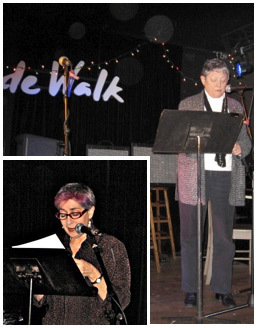 Elinor Nauen and I hosted a monthly reading series, Prose Pros, currently at Side Walk Café, Avenue A @ 6th Street, on the Lower East Side. For more about this, click below. From 2007 to 2018, I was co-curator with Elinor Nauen of this series. We presented two prose writers on the first Thursday of each month — chosen to compliment or complement each other. And we had some incredible events. A few weeks after I made the decision that 12 years were enough for me — nudged by the inescapable fact that I must ration my time if I want to complete various projects — hey, folks, I am in my eighties! — our wonderful host, the Side Walk Cafe, changed ownership. Please contact Elinor for information about future readings.